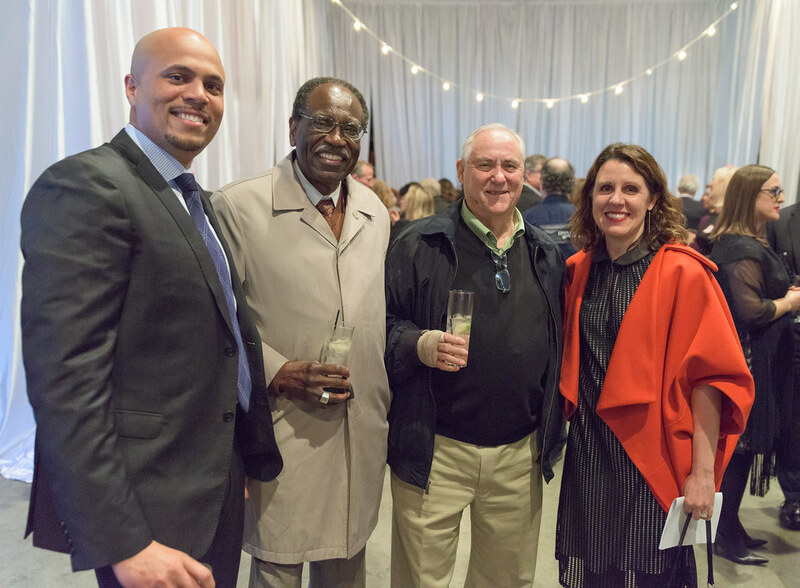 PORTLAND, Ore. – Cascadia Behavioral Healthcare celebrated the progress of its capital redevelopment plans for the new Garlington Campus with nearly 370 guests on April 5 at its 2nd annual A Culture of Caring Gala. The Northeast Portland campus is home to the Garlington Health Center, a new whole health care center due to open late summer 2018, and Garlington Place, a new 52-unit affordable housing apartment building. Through the generosity of guests and sponsors, the Gala raised $200,000 in support of the Garlington Health Center, and shared in the announcement of a $100,000 grant from the Maybelle Clark Macdonald Fund bringing the philanthropic campaign year-to-date total to $3.2 million. The campaign goal is $3.5 million. Cascadia had previously secured a $1 million land donation toward the project. The new Garlington Center will deliver integrated healthcare – bringing together mental health, substance use support, primary care, and wellness services with a retail pharmacy in one location to better support a person’s whole healthcare needs. Residents began moving into Garlington Place Apartments earlier this month. Studio, one- and two-bedroom apartments in the building are available to Cascadia clients, veterans, and displaced North and Northeast Portland residents. A highlight of the Gala was the unveiling of two mural designs – one by renowned Oregon artist Arvie Smith, the other by emerging Portland artist Jeremy Davis – that will serve as visual anchors for the new Garlington Health Center. Smith’s work will span the Garlington Center’s south wall, facing NE Martin Luther King Jr Boulevard. Davis’ piece will be located at the Center’s front entrance at 3034 NE Martin Luther King Jr Boulevard. Cascadia also revealed a replica of the donor recognition sculpture trees designed by Portland-based artist Hillary Pfiefer, and hosted a virtual reality tour of the new Garlington campus for guests to experience during the cocktail reception. Pfeiefer had a series of sculptures on view at the reception. Other featured art included works from Meghan Caughey, artist and Cascadia’s senior director of peer wellness, and Jo Lundberg, a local artist who also works as a mental health counselor. As part of the Gala program, three Portlanders received Culture of Caring Awards for their contributions and vital roles in strengthening our community’s social, physical, cultural and emotional wellbeing. Kay Toran was honored for her achievements in promoting greater awareness and importance of building healthy, vibrant communities. Reverend Dr. T. Allen Bethel was honored for his work in building community and civic engagement. Darrell Grant was honored for building community through the arts. Gala guests included Multnomah County Commission Chair Deborah Kafoury, Multnomah County Commissioner Sharon Merien, Oregon State Senator Lew Frederick, Oregon Representative Robe Nosse, Metro Council President Tom Hughes, Metro Councilor Sam Chase, Soul District Business Association Chair John Washington, NAACP President Rev. E.D. Mondaine, and US Representative Earl Blumenauer. Poet Emily Newberry dedicated a poem in honor of the Garlington Health Center and Aurora Chorus Outreach Ensemble entertained the audience with moving choral arrangements on the subjects of social justice, healing and hope. Award-winning Metropolitan Youth Symphony’s jazz ensemble also played for Gala guests. Cascadia Behavioral Healthcare is a private, not-for-profit whose mission is to provide whole health care for people living with mental health and addiction challenges. For information on Cascadia’s comprehensive range of innovative, integrated clinical and housing support programs, visit: cascadiabhc.org.